432 pages | 53 B/W Illus. Standing as the only text focused on the pharmaceutical treatment of asthma, this reference details the pharmacology, mechanisms of action, efficacy, and safety of every drug currently used in the management and care of asthma patients. Internationally renowned authorities cover published practice guidelines, treatment plans, pharmacologic agents, and clinical studies to provide the most authoritative and up-to-date information on the use of medications to control and prevent this common condition. * examines international guidelines for the drug treatment of asthma. 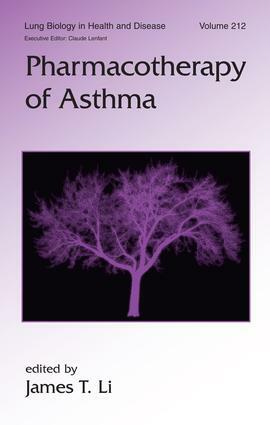 "…The strength of this text is its discussion of the basic pharmacology mechanisms of asthma drugs. All of the authors wrote concise, easy-to-understand sections on complicated information." "…a comprehensive attempt is made to adopt observations of authorities from diverse, worldwide experience, providing a comprehensive, up-to-date reference for investigators and practitioners."